Human beings have been mapping the physical space around us (including topography, landmarks, structures, and even the stars) for thousands of years. Throughout that time, we’ve employed a dizzying array of tools and instruments to get the job done. Regardless of the tool, the principle behind gathering an accurate set of measurements always the same – identify a point in space and relate a lot of other points back to it. As an As-Built service company for the last 16+ years, PPM has been focused on developing the most accurate and efficient way to do just that for our client’s renovation projects. Last year, PPM took the next step in our evolution of As-Built surveying and started employing high-definition laser scanners on our projects. 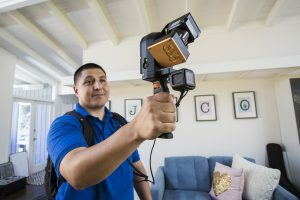 These high-tech surveying instruments are helping us to capture and analyze much more building data, in much less time onsite. It’s nothing short of a paradigm shift in the way that we create accurate As-Built drawings for our AEC clients. The high-definition laser scanners we use for As-Built Surveying. GeoSLAM Zeb Revo (left) and Leica BLK360 (right). Affectionately referred to in our office as “Reva,” this mobile scanner uses Simultaneous Location and Mapping (SLAM) algorithms to both move through a space and take 43,200 measurements per second all at once. This allows our surveyors to work quickly and accurately on-site. It’s become our best friend on the job and property owners love it because it’s fast and unobtrusive. Even though this little wonder can’t move and scan at the same time like Reva (it’s a “terrestrial” scanner), the BLK360 gathers more detail, panoramic photos, and even thermal data in every scan. 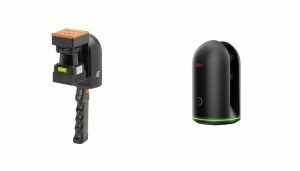 Although it takes a little longer in the field, the BLK360 laser scanner can be operated in nearly all conditions, and provides us with almost every bit of information we need for our As-Built surveys. 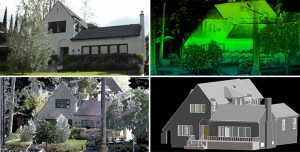 For output, both devices create a 3D “digital twin” of the buildings and property they scan. These large data sets are called Point Clouds, and this data is what our drafters use to create extremely precise As-Built plans in CAD or BIM software. Live photo (top left), image from Zeb Revo Scan (top right), image from BLK Scan (bottom left), and Revit 3D As-Built (bottom right). How Has Laser Scanning For As-Builts Helped PPM and Our Customers? Increased Efficiency: Creating accurate As-Builts relies on a precise relation of measurements to each other, in 3 dimensions. PPM has always used an air-tight method to do this, but it required a lot of time on-site to gather and record the measurements. Employing laser scanners cuts the time on-site by 70-90%. More As-Built Information: The large Point Cloud data sets gathered by the scanners gives us nearly every measurement of a building – not just the ones we need to create a floor plan or an elevation. This has enabled us to help our clients gain access to additional information and drawings they didn’t know they needed until after we completed their job – all without needing a re-visit to the site. Scalability: It’s no secret that the architecture industry is moving toward Revit and other BIM software for drawing and design. All this additional data gathered on-site has made it easier for us to utilize the power of BIM to create As-Builts. Good 3D data is essential to any BIM model. In addition, the scanners come equipped with a lot of extras. One we’re excited about is thermal imaging on the BLK360. This technology could enable us to provide valuable energy efficiency data to our clients when that functionality is fully available. PPM has always been all about helping our clients achieve Worry-Free Renovations. It’s been our purpose for over 16 years and 17,000 As-Built projects. The implementation of laser scanning into the PPM process allows us to provide you with even more accurate As-Built building data, in less time and with less of an impact on you and your client’s schedules and project timelines. We are excited to continue to push forward with new surveying technologies, and we look forward to sharing more about how we are using laser scanners on our As-Built surveying projects with this blog in the months and years ahead. What Is An As-Built Survey? The Most Critical Part of your Remodel That You’ve Never Heard Of. It happens all the time, even after 16+ years in business. 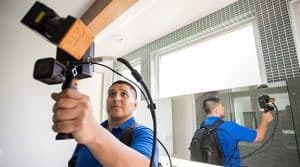 Someone asks me “What do you do for work?”, and I tell them that PPM provides As-Built surveys to architects and other design and construction professionals. Unless I’m talking to someone in the industry, the next question is almost always “What is an As-Built survey?” Now I get a chance to once again practice the response that I have carefully refined over hundreds of conversations: “We measure the inside and outside of a building with very accurate lasers, and then create a drawing which shows the exact dimensions and layout of the building. That’s an As-Built survey.” At this point when I have finished this basic explanation, I have found there is an approximate 50/50 chance that the person will either want to ask more questions about the lasers, or change the subject. The hand-held Zeb-Revo scanner, made by GeoSLAM, is used to collect the most accurate level of data from each survey. Most people have seen blueprints of a building at one time or another. A typical blueprint is a design drawing, which shows the intended or proposed layout of the building. An As-Built drawing, as the name suggests, shows the current layout of the building “as it was built”. As-Builts do not deal with the hypothetical but instead with the actual. This is a critical distinction, because a constructed building almost never corresponds exactly to the original design drawings. 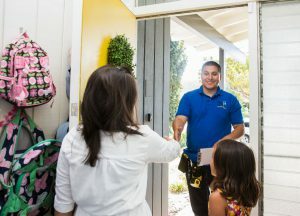 For this reason, when starting a new remodel project on a residential or commercial building, the architect will almost always create or commission an As-Built survey, rather than trying to rely on existing building plans. Discovering an error on the plans that can result in additional costs or delays to the project is just too big of a risk to take. We are your trusted professional resource for assisting with a successful start to any remodel project. What Is An As-Built Survey? It’s What We Do! 16 years ago, I was probably one of those people that would have changed the subject if someone starting talking about As-Built surveys. Now, they are how I and the other 25 people here at PPM make our living. Helping our clients, and their clients, to have a Worry Free renovation experience using PPM’s As-Built plans is the Purpose that drives us each day. To me, the value of good As-Built drawings is self-evident: It’s why architects and other industry professionals keep calling PPM to help them get a great start on their remodel projects. Give us a call today if you are interested in A Better Plan for your As-Builts.